Now owner Sarah Glazier, a local craft enthusiast and promoter of all things handmade, has reinvented�Glazed All Over�as a beautiful craft space and a great place to relax with friends and be creative. 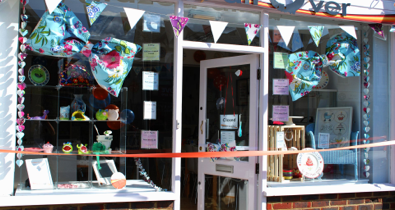 In its home in Wallington,�Glazed All Over�runs wonderful workshops in all sorts of arts and crafts from glass work to clay modelling and offers great opportunities for people of all ages and abilities to unwind, have fun and be creative. “We run Ladies Night and evening glass workshops once a month, perfect for mums to take some time out and do something for themselves," says Sarah. "Ladies Nights are a great chance for mums to chill out, unwind and catch up with some friends while doing something creative," explains Sarah. "You bring the wine and nibbles and we provide the fun!" And it’s not just for seasoned craft enthusiasts, kids love�Glazed All Over�too. “As well as the much-loved Clay Club and parties we are launching a Drawing Club after Easter and a range of crafty school holiday workshops for children,” explains Sarah. Everything at their beautiful workshop is true to�Glazed All Over's handmade ethos. “We really believe in the benefits of handmade over mass-produced gifts,” explains Sarah. Sarah is thrilled to be able to play an active role in the local community by giving local people the chance to be creative. “Our main objective is to encourage families to spend quality time together and do something they wouldn’t usually do,” adds Sarah.